May I ask what File do I need to edit so that my AA(Anti-Air) will fire red tracers? moved thread to more appropriate section of forums. I think he's referring to AA tracers. For that you could try turning up your settings higher and enabling small objects. I mean modding it..I want to change its color to FULL RED.. So I want to Mod it myself the file that involves the color of the AA tracers. can you give me the specific file that involves them.. I don't know what to edit in this Trail files..
Actually you can.. that AA files are the Trail_Aura DDS.. I already change mine.. took me some time though..
can i change the color of shell myself ? can I chance to HE for orange and AP for yellow or white ? if yes .. how to do it. thx. 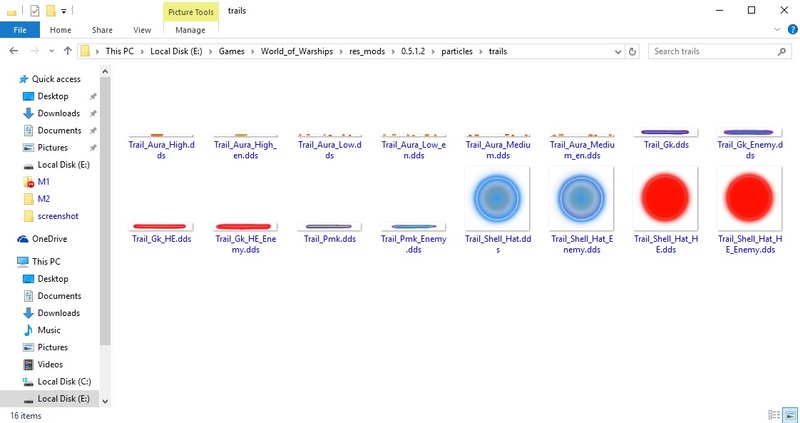 These are the files that you need to edit to change your shells color..
Is this change gonna make the game got some error when new update/ patch come up? or it will be overide by new files and I have to edit it again ? as long as you put it in the res_mods folder you don't need to worry of them being override or replaced by the original files..
You just need to create a few folders to do that..
First Open the your World of Warships folder, then look for the res_mods folder open it up.. then you need to look for the folder named 0.5.1.4 which is the latest version of WoWs as of now.. after you open it.. Create a new folder named "particles" (without the quotes), then inside it create another named "trails"(Without the Quotes) and put your tracers mods inside it.. and your Done! By doing that you don't need to change or overwrite the original files of your game.. Be advice that you need to change(To the latest version of wows) the name of the folder where you put your mod(Marked with Blue Rectangle) when the game updates..